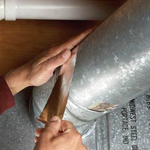 A duct system that is well-designed and properly sealed can make your home or business more comfortable, energy efficient, and safer. Because your home or business heating and air conditioning system air ducts are often concealed in walls, drop ceilings, attics and basements, repairing them can be difficult. But there are things that we can do to improve the air duct performance in your home or business. Contact us to evaluate and review your ductwork system and we will make the appropriate recommendations to maximize your energy savings, from sealing air leaks using mastic code approved sealant or metal tape and insulating all the ducts that are accessible (such as attic, crawlspaces, unfinished basement, drop ceilings, and garages). We only use UL required tape for each application and long lasting. Also, make sure that the connections at the vents, supply and return registers accessible are well sealed where they meet the floors, walls, and ceilings. These are common locations to find leaks and disconnected ducts in the heating and air conditioning system. Call us today to schedule an heating and air conditioning energy efficiency evaluation performed on your air duct system.